The web page below discusses the (many) options of how to build a Porsche 962 with the original boxy IMSA longtail. Most of it became instantly superfluous when M & S Hobbies issued its transkit for the 1984/85 longtail IMSA Porsche 962 in February 2010. I haven't seen it yet, and until that moment the page below will remain as it was. According to the M & S Hobbies website, the transkit includes body, tires, wheels, vacuform windows, radiators, fuel fillers, headlight lenses, headlight covers, taillights, rear diffuser, exhaust pipe, rear wing and rear wing uprights. The transkit is designed to be combined with the Tamiya 962 kit. the Tamiya 962C, a curbside kit, with Kurzheck / short tail. This model has some problems: the inlets in the doors are very shallow, the body has integral windows which make painting difficult, the wing is molded integrally with the body, and underneath it, the body has a nasty step. Lastly, there are large holes for screws on each side, with plastic plugs. This is definitely not the usual Tamiya quality! Ben (or Ben Hobby) from Japan reissued the Tamiya 956 as a 1987 Leyton House 962C, with the 956 kit in the box! 197: Canon. This issue contains one unique part: the separate nose-mounted wing, very nicely detailed even, that was used in both Group-C and IMSA for a short time. I haven't seen the Protar kit myself, but I haven't heard much good about it (I'm building a Protar Lancia LC2 which isn't much fun either). Reported problems are: misshapen and clumsy looking nose (the leading edge is perhaps twice as thick as it should be on a Kurzheck 956), the doors don't fit, no suspension or suspension detail, no engine, unrealistic undertray tunnels, heavy handed details, surface detail is missing, and very thick plastic. The only positive comments regard the decals, which are more opaque and more brilliant in color than the Tamiya decals. The main attraction of the Protar kit is the short tail, which makes it rather different from the Tamiya kit. But adding a Plastic Hut Kurzheck tail to a Tamiya kit is very likely much quicker and simpler route to go. Tokyo Marui (aka Tilt) issued a Porsche 956 'Trial Racing Car' in 1986, intended for some sort of track racing. The body is a single piece including the windows, injected in clear plastic. The chassis appears to be nylon. The remaining parts are a partial driver figure, four wheels and tyres, a Mabuchi RE280 motor, a battery pack and some metal hardware. It is reported to be four wheel drive. An 'Iseki Tractor' version (number 4 in the series) had catalog number MT59-TR4-1200. A NewMan and Rothmans version is also reported. Other models in the series are #3 Nissan Silvia Turbo (March 83G), 1983, #5 MCS-V, 1984, Lark sponsoring and #7 MCS-V, 1984, Epson sponsoring. Profil 24 from France produces a very nice multi-media (largely resin) 962C model, with a one-piece curb-side body. Six kits are available, that reportedly use three different body shapes. They also announced a full detail version of the 962C model for late 2005/early 2006. Reportedly it should have openable doors, separate front and rear hood, a detailed engine, and a chassis in photo-etched parts. Mid 2006 it hasn't been issued however. the Tamiya 956 is a 956 and not a 962, so it lacks the moved-forward front wheels with resulting longer center body and steeper sloping nose. For reference, the windscreen is 43 mm wide and 40.5 mm long. the Tamiya 962C has very shallow door inlets. It was long thought that this was due to its TamTech RC background, to make room for the RC internals. But other models from the same series do have deep inlets, so this explanation appears to be incorrect. It seems that the car Tamiya measured really had these intakes. Indeed some IMSA cars had more shallow inlets, as discussed on the previous page. But this was usually only on the right side (as far as can be seen), and did not results in four very squashed radiators, as Tamiya moulded. The inlet question remains unsolved for now. Another issue is that the body has integral windows. Since the From-A model is yellow, there is no way of getting rid of the yellow plastic showing at the edges of the windows. It is reported that one brave modeler popped them out of the body; I tried it, but I chickened. The windscreen is larger than the 956, 44.5 mm wide and 42 mm long. I had some doubts about the wheelbase (being compromised to make it fit on the standard TamTech RC chassis), but it measures OK. I'm not completely sure, but the cars looks like a 1988 season 962 to me: it has larger rear wheels, circular rear wheel openings, and lower venturi tunnels. The Kurzheck (short tail) wing is molded integrally with the main body. Underneath the wing, the rear body has a nasty step. Reportedly the wing supports need to be replaced. Lastly, there are large holes for screws on each side, with plastic plugs. the Hasegawa kits (I had the blue-white Omrom version) has a rather different 'feel' than Tamiya kits. Many parts are a little more toy-like, and not so nice as in a regular Tamiya kit (which the Tamiya 962 definitely is not!). For example, the rear drive shafts do not run through the venturi tunnels, as they should. Like the Tamiya 962C, it represents a 1988/89 season car, and it has similar details (rear wheel size, wheel openings, venturis). Like the Tamiya, it has a Kurzheck (short tail). The Hasegawa 962C has different side panels compared to the Tamiya 956 and 962: it has no louvers and the exhaust opening is are positioned differently and smaller. The Hasegawa windshield is shaped differently, 43 mm wide and 39 mm long, and looks distinctively smaller. The headlight covers differ too and are larger. The cockpit area is slightly different. The model has one shape problem: the inner side of the rear part of the front fenders is much too rounded. Lastly, one subjective comment: it has been said that the Hasegawa 962 has a more aggressive look, it looks more purposeful and businesslike than the Tamiya 962 which looks soft and more rounded. both the Tamiya and Hasegawa kits have side windows that are too short, with Hasegawa being the worst offender, with 2 mm missing in length. I compared the three bodies too see which one is best suited for a 1984/1985 IMSA 962. The Cotton/Büsing/Upietz book (pages 44 and 45) explains that the cheapest way to make the 962C faster was fitting narrow, large diameter (19" by 14') rear tires from the 935 Baby. This allowed wider tunnels and more downforce. This indeed worked, but resulted in a car that was 1-1.5 seconds faster, but tricky to drive. Suspension work improved the drivebility. It is unclear to me whether the 962C Langheck also had 19" rear tires. There's no need for more downforce at Le Mans, drag reduction is more important. Photos from Le Mans in 1985 and 1986 suggest smaller rear wheels, probably 16" like on the 956.
the rear wheel opening of both 962Cs is circular, whereas the 956 has 'flattened' circular openings (look at the header photo of the previous page to see what I mean). The 1984 IMSA 962 had 956-like rear wheel openings. Conclusion: the whole rear side of the 956 is much more accurate for an IMSA 962 than the two 962C models. 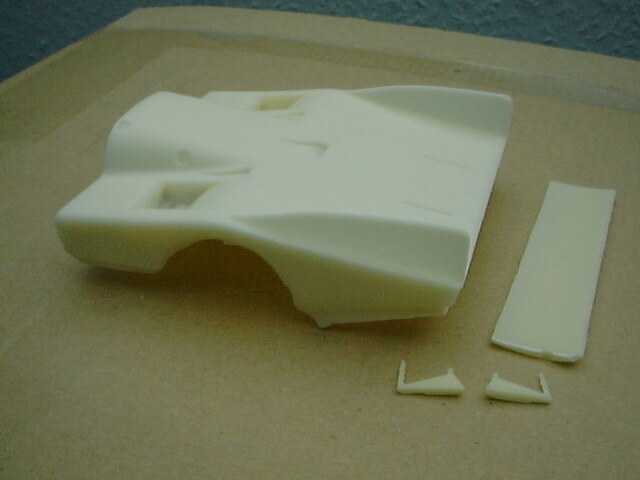 But the nose has to come from a 962, and then the Tamiya model is most likely to fit best. A kit-bashing of the two kits appears to be the best solution, although not simple. It has the advantage that it is possible to build a fully detailed engine bay. The completely air cooled, two-valve engine IMSA engine could become available again through PPRR, and adding that *huge* single exhaust pipe is very tempting! Interest in 956s and 962s remains high, and in 2003 two new resin bodies came out, followed by more. Micro Nitro produces a 956 transkit in the high-downforce configuration. The resin body is in two parts. 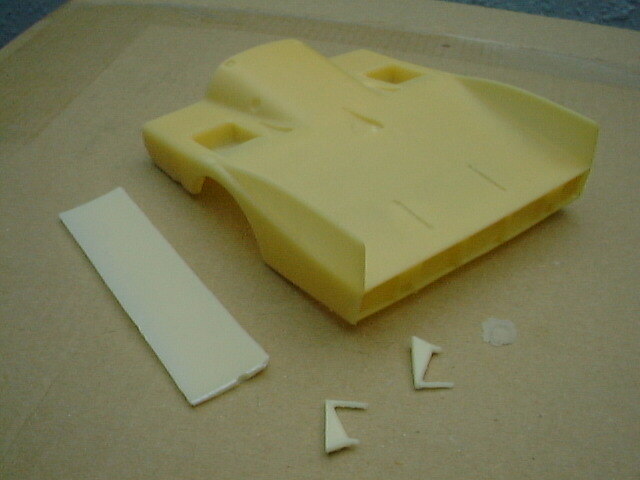 Other resin parts are the separate rear wing and a rear lower side, and optional nose wing. Windows and headlight covers are vacformed. Photo-etch sheet. Large decal sheet for the #18 Jägermeister car. Reportedly it is the Studio 27 short-tail conversion (see below) installed on a Tamiya 956 body (as intended by Studio 27) and then recast rather poorly. The photo etch is of good quality. It dates from 2006 or earlier. Perry's Resin Replicas issued an IMSA 962 body shell with some detail parts in July 2003. The body is intended for use with the Tamiya 962. The body has a short (Group C) tail, as used by nearly all teams from 1985 on. It has a large air scoop on the engine cover, and thus represents cars with the intercooler mounted on top of the engine (as nearly all cars had from appr. 1986 on). Detail parts include a separate wing, rear replacement undertray (reportedly more accurate than the M&S Hobbies one), turbo with exhaust, cooling radiators, louvers for rear ducts, BBS wheels, number lights, and vacuum-formed windows. The BBS wheels are 17" and 19" wheels though (Group C size), while 16" would be correct for an IMSA car. Another possible problem is that the side radiators not accurate for IMSA 962, and reportedly the scribing around roof NACA duct isn't symmetrical. The latter will be corrected in the new mold. A new set of suitable 16" wheels is in the planning stage. M&S Hobbies issued several IMSA 962 transkits, the first came out in October 2003. First reports of the kit say that some details are not as nice as the Perry's version, but the engineering is somewhat better, and it has correctly sized wheels and tires. The fit on the Tamiya chassis is tight and solid. You have to saw off the rear tunnels on the Tamiya chassis to fit the correct IMSA version. Casting is by Joe Vondracek of Quick Skins. Decals are designed by Mike Quarterman of UMi Modelworks and printed by Cartograph. Packaging is good and the instructions clear. The cost is about 1/3 more than the Perry body. the short-tail version from 1985-1987. It is designed as the 'Lowenbrau' car, decals sold separately. The body can also be used for any other IMSA 962 from that era: Wynn's, Miller, Dyson, Bayside Disposal/Bridgestone (1987), Coca-Cola, Dyson (1985), Budweiser and BFGoodrich, most of these decals are available separately. late eighties version, possibly similar to the above but with additional front wing on the nose and 'canards', and headlights instead of headlight covers. No decals. The 1989 Daytona winner Miller-sponsored 962. Very likely with the special tail section as fitted to the real car, and front fenders with vents. Two Guys Racing announced a resin IMSA 962 for early 2003. It would be numbered SPDTK1, to consist of the full body, photo-etch and decals. Unconfirmed details are an 'early' IMSA 962 body style, a high downforce front bodywork, a long tail configuration and IMSA intercooler bulge on rear deck; it should represent the 1985 Daytona and Sebring winners as well as a Akin Coke 962. Unfortunately, Two Guys Racing stopped trading early 2003, but the kit is expected to be issued by another company. Several 962 body parts are currently available. Basically about every body style can be built with them, except the early 1984-1985 IMSA 962 with the 'boxy' tail. PH-6: a complete 962 front, which complete replaces the cockpit and nose part of the 956 kit, plus vacuum formed window, side glass, and headlights. The resin casting is reportedly a little rough, with quite a few bubbles/pinholes and some warpage. But this option does not require any mating of components, and it is quite affordable. The only photo I know of this set is shown at the Automobilminiaturen site, more specific this page. 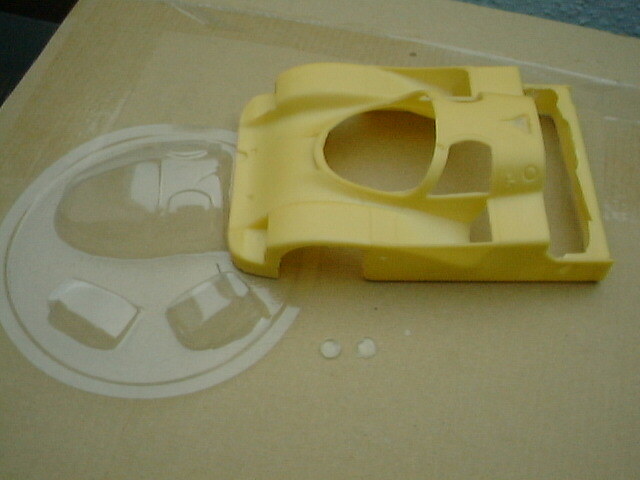 The photo shows that the nose section has a concave area, which the Studio 27 kit does not have (it is straight there). I think I see a concave area in most photos of the real thing, although not as pronounced as on the 956. It is also reported that the (otherwise correct) intakes need to be shortened slightly. PH-? : a resin 956 Kurzheck tail (1983-1986). This has probably no use for an early IMSA 962. PH-1: a resin 962 tail, Langheck / longtail Le Mans versions, representing the 1986-1988 version, which ends like the 956 Langheck narrow rear panel. It has a (correct) round wheel opening and higher curved deck which accommodates the larger wheel diameter of the 962. PH-3: a resin 962 tail, Langheck / longtail Le Mans versions, representing the 1988-1991 version, which ends in a higher rear panel, because the ground effect tunnels were lowered. For anyone wanting to order Plastik Hut items: this company was dormant for a while, but is expected to resume production early summer 2004. Contact Sven Halle for more information. The boxy tail is not correct for the 1986/1987 Rothmans car, and the instructions advise to use the 956 rear. A built up model is shown in this photo. The Studio 27 components are of very high quality, but rather expensive. Studio 27 will issue four new transkits in December 2008, again to convert a Tamiya 956 into a Group C 962 Langheck (long tail) from 1989/1990. Details to follow. Shunko issued a 962 Langheck resin set in three versions, see this page on the Shunko website. Judging from photos it is intended for the Hasegawa model. Black Box Prototypes (see their Ebay store) issued a Porsche 956 Kurzheck transkit late 2005. It consists of a resin short tail body work with rear wing, machined aluminum rims with resin BBS centers and wheel nut, and decals for the 1985 #2 and #18 Schiesser car (three car options). Perry's Resin Replicas started selling separate doors that fit the Tamiya 962C in January 2003. They include vacform windows, radiator faces and hinge parts. These replacement doors would solve one of the biggest problems of the Tamiya 962: its shallow door inlets. These doors will not fit Tamiya's 956, by the way. MicroNitro also started selling resin 962 replacement doors, late 2003. Included are the doors, radiators, hinges and vacuum formed windows. They can be mounted open or closed. From the photo on their site I conclude that this is identical to the Perry's Resin Replicas set. SPD-RP13: a resin short tail/engine cover for the Tamiya 956. This part is an exact resin copy of the Tamiya 962 tail. It therefore has too large wheel openings, the waist line should be deeper, the fins should be higher and the wing should be longer. SPD-RP14: a resin long tail/engine cover for the Tamiya 962. This part is an exact resin copy of the Tamiya 956 tail. Depending on what version of your 962C, the parts require modifications, such as circular wheel openings, 'wheel bumps' in case of 19" rear tires, rear panel height and wing changes. Speedline products are sold by Strada Sports. Harald Weber from Germany makes photo-etched exhaust panels in 18 variations. He's not producing them on a commercial basis, but you can write him if you are interested. Harald kindly sent me a set specifically for the Akin 962 car, and the quality of the panels is superb. As an alternative to resin doors, it's almost worthwile to buy a second kit to cut the doors from. Although it is for the Porsche 956 and not the 962, the Scale Motorsports 956 superkit has to be mentioned. It contains four large photo-etch sheets that allow one the build a complete chassis, plus dozens of detailing parts. In the 1984 IMSA season the same wheel sizes were used as in Group-C: 16 inch diameter, 13 inch wide at the front, 15 inch wide at the rear. Dunlop Denlocs were used in Group-C (280/600 front, 350/650 rear), but these were replaced by Goodyears in IMSA. I do not know their sizes, but they look very similarly sized to me. This means that all tires and the front wheels of the Tamiya 956 can be used (the raised Dunlop and Denloc markings have to be sanded off though). The rear wheels are a bit of a problem: the Tamiya 956 has 6 spoke Speedlines, but we need BBS multi-spoke wheels. The listing below includes all aftermarket 956/962 wheels, including 17, 18 and 19" BBS wheels that are not applicable to a 1984 IMSA model. Some comments on 962 wheel sizes can be found on pages 124-125, 133, 139-140 and 144 of the John Allen book. An important note when you measure kit (and real) wheels: the tire retaining lip adds 1.6 inches to the wheel diameter, and you need to deduct that from your measurement to find the true wheel size (which is based on the inner diameter of the tire). One last remark: the Tamiya 956 wheels appear to be slightly to small: they should be 16" as reported above, but measure 15.4". That's an 0.6 mm difference which is not really important, but it did cause much confusion on my part when comparing them to other wheels. Tamiya's Joest Porsche 962C (#24097) has 18" rear BBS wheels. They are slightly different compared to the rears from Perry's Resin 962 set. The Hasegawa Brun/Repsol 962C (kit CC-14) has 17" front and 19" rear BBS wheels. I am not sure whether the real car had 19" rears, since this would require an extra bulge on top of the engine cover. Also, the 19" tires should be narrower than the 18" tires, and they are not. The wheel size could also be the result of the not uncommon practice of increasing the wheel size to make the model look better. The same could apply to the front wheels. To be continued. 16" 956 BBS rear wheels, cast in resin. These are the wheels required for an early Akin 962.
a 962 BBS wheel set with 16" fronts and 18" rears, that can be used on numerous Group-C 962s and possibly other cars too. These are not repops of the Hasegawa 962 wheels (from kit CC-14) as reported earlier, but specially made to fit the Tamiya tires. SPD-RP6: a resin BBS rear wheel set for the 956, released in 2002 . A size is not mentioned, but I assume they are 16". Judging from the photo on their website, the 'spider' is much larger than on Perry' Resins wheels. Akin used ones with small 'spiders'. Arrowhead Aluminum Accessories released a set of BBS wheels early 2002. They consist of a set of 4 wheels (both front and rear), each consisting of two-part machined aluminum rims with a resin insert. Both the multi-spoke BBS and the 6-spoke Speedline insert are supplied. Cost is approximately 25 US$ for a set of 4 wheels. Wheel diameter is not known. a set of four wheels for the 962C, designed for the Tamiya tires. The wheels have turned aluminum rims, white metal BBS mesh type inserts and photo etch to depict the rivet detail. Reportedly the rims lack the steps characteristic of BBS wheels. The wheels are 16" front / 18" rear. More photos of the M&S Hobbies wheels can be seen on Scott Truesdells website. The wheel set is also sold by MicroNitro. the resin tire and BBS wheel set that comes in their 962 transkit separately. Studio 27 issued a "Porsche 962 Mesh Wheel set" (FP2463) in November 2002. Mesh wheel means BBS by the way. They are the M&S Hobbies wheels, marketed only in Japan. I measured the rims at 18.8 mm (front) and 20.9 mm (rear), not using calipers though, which makes them 16" and 18" wheels respectively (after deducting 1.6" for the tire retaining lip). They fit the Tamiya 962C tires perfectly. Strada Sports produce a set of resin 15" BBS wheels, including differently sized tires. 15" wheels were not used on 956s and 962s, but since this listing is already extensive I added them anyway. David Durst (see his great Rothmans Porsche) reports that Tamiya's Toms Toyota 84C has a perfectly suited wheel set. A closer check revealed that the Toyota's wheels are not true BBS wheels, but another brand (Rial??). Compared to the BBS front wheels of the Tamiya 956 kit, the dish (the spoke area) is somewhat larger, and the rim lacks one step. They are very close however. Alternatively one could widen a Tamiya front wheel to make a rear wheel. Another IMSA specific detail is the 'turbo bump' or the 'intercooler scoop' on the engine cover. First a explanation of the difference. Early IMSA 962s had the turbo located above the gearbox, and intercoolers behind the door inlets, like the 956 and 962C. This configuration required a 'turbo bump' on the engine cover, which existed in 3 variations. Later 962s had a single large intercooler above the engine. This required a large air inlet, and this is referred too as the 'intercooler scoop'. The scoop existed in 4 variations. In 2001 Speedline came out with a series of 962 aftermarket details, including decals, turbo bumps and wheels. They issued the same three turbo bumps, apparently stemming from the same masters as those of Perry's Resin. The bumps are too high however, and must be cut down to fit properly on the engine cover. (Photos were kindly supplied by Tom Hiett). Plastik Hut also offers resins IMSA turbo bumps, that look quite similar. A photo can be found on the Automobilminiaturen site. Mark's Motorwerke used to produce a resin IMSA 962 engine in two versions. It had 17 resin parts, 5 pieces of plastic rod, 1 piece of aluminum tube and 1 small piece of aluminum sheet, plus a 5 page illustrated instructions. It was produced in both early air cooled and later water cooled cylinder head versions. A drawback however is that they are (reportedly) very rough. They appear to be based on the Tamiya 956 block with various bits either scratch built or converted Fujimi 911 pieces. The intercooler was the smaller of the two used. another option is to start with a Fujimi 911 engine. Early IMSA 962s had air cooled single cam single spark plug engines, and the Fujimi engine is exactly like that. Later 962C motors were water cooled twin cam single spark plug engines, and for that era the Tamiya engine is most suited. Possibly the engine from the Tamiya 911 GT1 would be an even better alternative. it was rumored that early 2002 some more IMSA 962 engines will come out, but they haven't materialised yet. A few photo-etch detail sets have been issued over the last years. Some may be useful for an IMSA 962, but since I don't have any of them, I can't really tell. Harald Weber from Germany makes photo-etched IMSA radiators in three versions (plain, vertically divided, vertically divided + covering 1/4th of inner section), plus an intercooler radiator, shown here in paper test versions. He's not producing them on a commercial basis, but you can write him if you are interested. Sports Craft Models sell the same sheet as David Romero, listed as "DEC55 1/24 Akin Porsche #5 Snippets"
Raceworks (USA) released a Akin/Coke 962 sheet early 2004, sheet number 2407. It contains decals for the following races: 1984 Watkins Glen, 1985 Daytona 24 hours (both with the big IMSA tail and 'Coca Cola' markings), and 1986 Sebring 12 hours and 1986 Columbus (both with Group-C short tail and 'Coke markings). There are quite a lot of other IMSA 962 decals on the market, but I don't have a complete list yet. It is reported that the Studio 27 decals for various 962s are tailored for the Tamiya 962, and may need small modifications if used on a Hasegawa 962. 'Der Porsche 956/962 - Vom Reissbrett zum Weltmeister' by Lothar Boschen and Gustav Büsing, Motorbuch Verlag, 1986. Detailed account (in German) of the car's development, extensive race results for each chassis. 'Porsche 956-962' by John Allen, Foulis Motoring, 1988. Less technical, more colorful. 'Porsche 956-962, The most successful sports cars from Weissach' by Ulrich Upietz in a limited and numbered edition (packaged in a box), expensive. Never seen it, unfortunately. Reportedly largely a photo book. 'Porsche 956-962 - Die Erfolgreichen Sportwagen-Legenden / The Legendary Race Winners' by Gustav Büsing, Michael Cotton and Ulrich Upietz, Gruppe-C Verlag, 2003. Reportedly this can be considered to be a second edition of the earlier Upietz book, cheaper than the original issue, with all different photos, but largely identical text (in German and English). Large hardcover in dustjacket, 320 pages, more than 1000 colour & b/w photographs and illustrations. ISBN 3-928540-40-8, price is around 98 euros. 'Porsche 956/962 - The enduring champions' by Peter Morgan, Haynes, 203 pages, lots of color photos, ISBN 1859609511, August 2003, price around 45 euro/dollar. Not related to the John Allen book. Very readable book that puts the history of the 956-962 into historic perspective. For modelers planning to detail the engine bay completely, I can recommend a booklet called 'Model Detailing Profile: 956 Engines'. This 20 page booklet discusses the complete plumbing of the engine using 10.5 pages of colour diagrams, 5.5 pages of text, and 5 colour engine photos. See the Speed Details Publications website of author Stephen Miller for ordering information. 'Porsche 956-962' by a yet unknown writer, published in 2004 by Unique Motor Books, ISBN 1841555754, price some 10 pounds. If like previous Unique Motor Books offerings it will be a collection of b&w reprints of magazine articles. The same report as published on Nicholas Henson's Scale Central web site. Nicholas Henson's article published on the Racing Resin web site. Dale King's collection of 37 Porsche 956 and 962s can be seen on the Automobilminiaturen site.